Weathered, but gleaming. Necklace is hand bezel set and framed sterling. 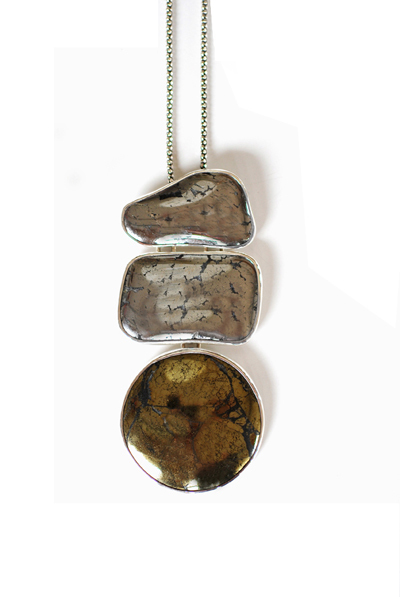 One of a kind collector cut stones of Native Silver and Metallic Ore all natural in color and pattern. Measures 4 inches tall x 2 inches wide, hangs from a 18 inch sterling chain. Weathered, but gleaming. 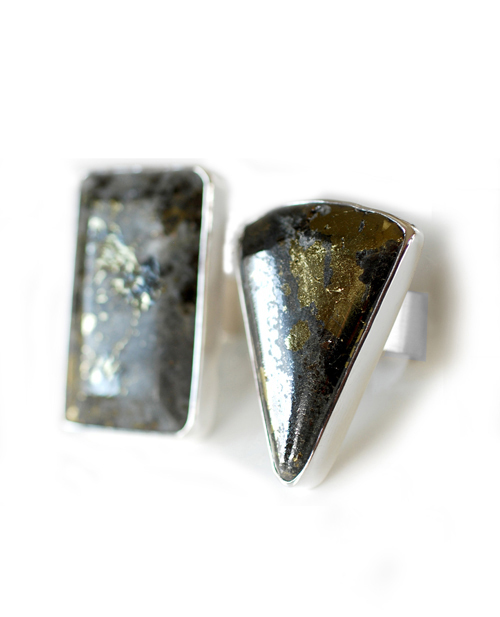 These Native Metal gemstones are super rare in find and highly metallic in properties that are all natural in their metallic form. 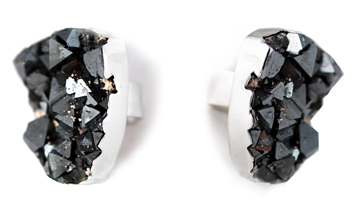 Beautiful and pure specimens of nature that mimic metal, yet have the natural impression of geology. Weathered, but gleaming. These Apache Goldstone gemstones are highly metallic in properties that are all natural in form and pattern. Natural soft rose colored hues are broken in pattern with this unique Jasper gem that sits underneath a wispy muted translucent Sagenite gem. Collector Sagenite is a rare and striking Agate stone that has needle like mineral growths within its soft dimensional layers. Sagenite measures 72mm wide x 41mm tall and Jasper measures 62mm round. Necklace is hand bezel set in sterling and hangs from a sturdy 18 inch chain. A dreamy, moody statement medallion to lay around your neck for those stormy windswept days. Staggering shades of soft green gems with sterling hand built bezel framework makes for this striking and rigid arrowhead necklace. Variscite, Chrysocolla, and Chrysoprase gemstones are one of a kind and all natural in color and pattern. Necklace measures 2 1/2 inches wide and 7 inches tall. Hangs on a sturdy 18 inch chain. 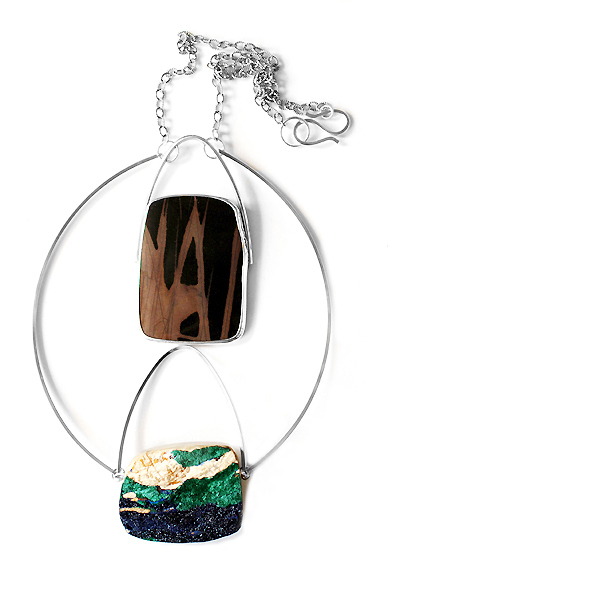 Welcome to the New Stone Age with this rare and eclectic statement necklace. Decorated with an alluring combination of stones. A metallic golden pyrite sits next to a shimmering rich dark green Russian Phylophate that changes color and sparkles with the light as the gem is viewed from different positions. Ring is entirely hand formed, forged and built from raw sterling sheet. Curved to cradle your finger and tapered at the back for a comfortable fit. Fits like a standard ring. 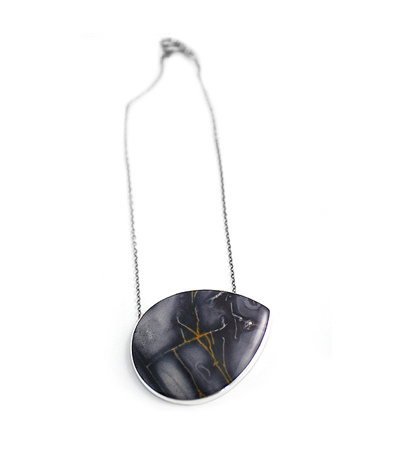 A rare and collectable Lavender Jasper from the Amazon Valley decorates this modern offset piece. Lavender Jasper gemstone is all natural in color and patterns and is hand bezel set in sterling. 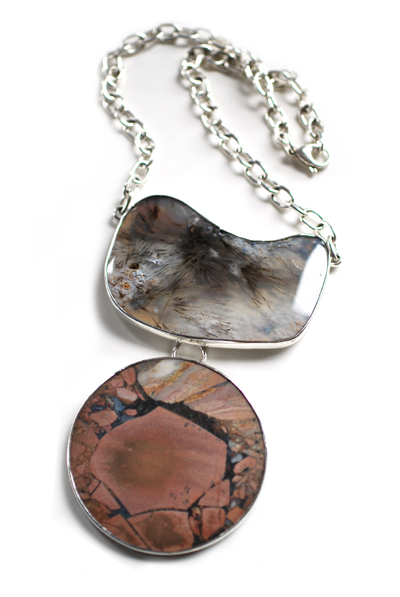 Serene and soothing cloudy translucent colors decorate this petrified wood gem. Layering neutral shades of lavender, brown, and beige are all topped with a pretty explosion of white. Petrified Wood is all natural in colors, textures and pattern and measures a dramatic and elegant 50mm tall x 27mm wide. 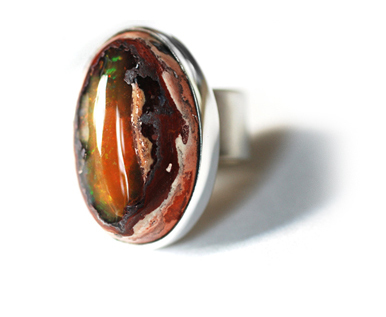 A one of a kind piece of preserved nature to rest upon your finger. A homage to the wonderful display of changing seasons. Petrified Wood, Jasper, and polka dot fossilized Petrified Palm Tree Wood make for an alluring combination of color in this long hanging statement necklace. Gemstones are all natural in patterns, color and shine. Hand bezel set in sterling. Necklace length measures 2 inches wide x 6.25 long. Hangs from a sturdy sterling 18 inch chain with 4inch extender. 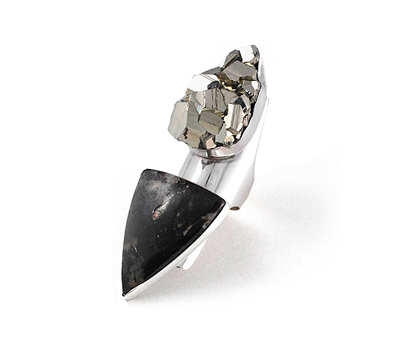 A Magnetite gem adorns this ring with its complex clusters of black to grey crystal cubes. All natural in it’s metallic color, luster, and shine. Magnetite gem measures 43mm tall x 36mm wide. 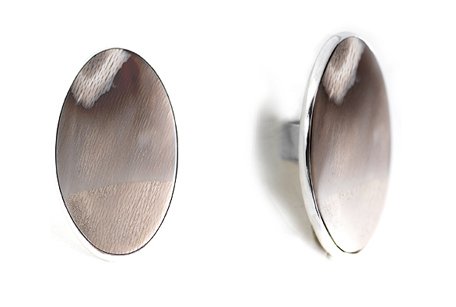 Hand set in sterling with edges that are delicately framed and filed to mimic it’s rugged lines. A one of a kind and an outlandish force to be collected. 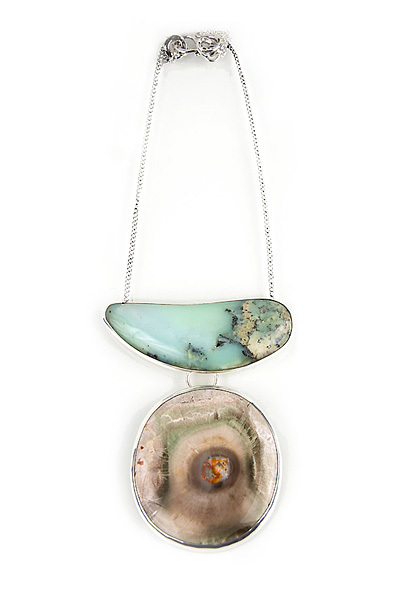 A rich and fiery combination of all natural colored gemstones adorn this necklace decorated with Wonderstone, Brazilian Agate, and Fossilized Petrified White Wood. Hand bezel set in sterling, necklace measures 4 inches tall x 5inches wide. A rare one of a kind ornament to collect that was built for Travelers, Drifters, and Nomads. 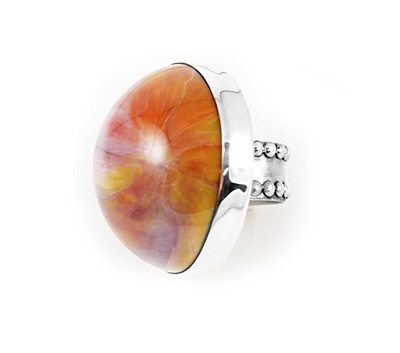 All natural in coloring and rare for it’s large size, Mexican Fire Opal is pure in it’s fire orange colored hues. Opal measures 24mm wide x 30mm tall. 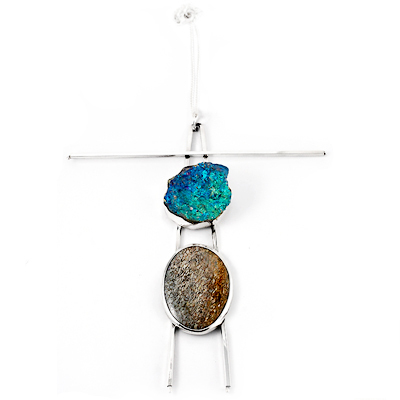 You can see this opal turn from bright to dark colors with it’s underlying rocky layers of iridescence. One of a kind Opal, hand stamped and numbered as a raw and rare glowing beauty to collect. 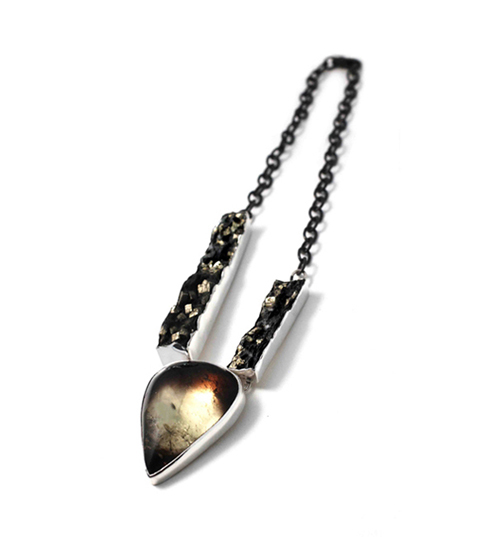 Guaranteed to create a stir in any room this pendant is hand set in sterling with glistening gems of Smoky Citrine and shiny Pyrite cubes encrusted in Slate, delicately framed and filed to mimic it’s rugged edges. Smoky Citrine measures 38mm wide x 52mm tall. 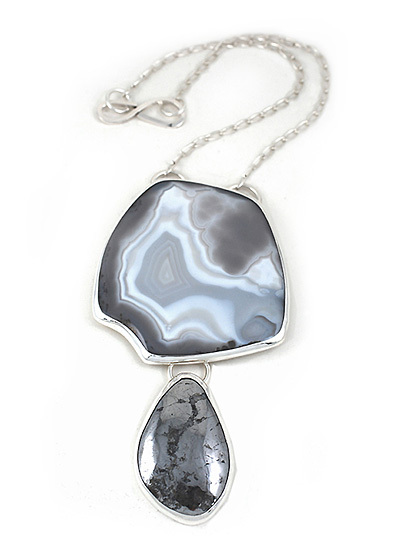 Necklace measures 5 inches long and hangs from a 16 inch oxidized sterling chain. A Dollybird original and rare piece that is sultry and enchanting at the same time. 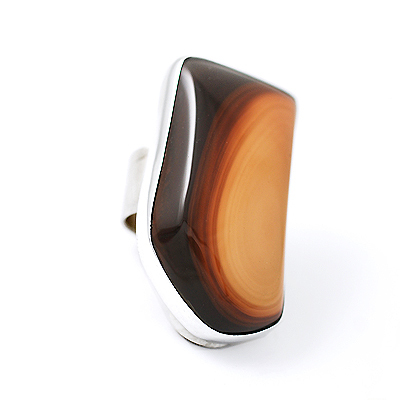 Made from Petrified Wood and all natural in color and pattern, this ring was made to entertain. Hand bezel set sterling. Ring measures 45mm in diameter, taking it to a 22mm bubbly height. Built for the lovers of fairy tales. I never wanted to be the princess, but rather the warrior. This armor ring was made with those childhood thoughts in mind. Hand forged, etched, drilled and oxidized sterling. Ring measures 50mm tall and tapers at the back for a comfortable fit. When the confusion becomes good. Fossilized Dinosaur bone in vivid, bright, cell patterns acts as a medallion that sits below a metallic blue Bornite Ore all natural in coloring. Necklace measures 7 inches tall by 5 inches wide and is set in sterling. Necklace length hangs 24 inches long. Be autonomous. 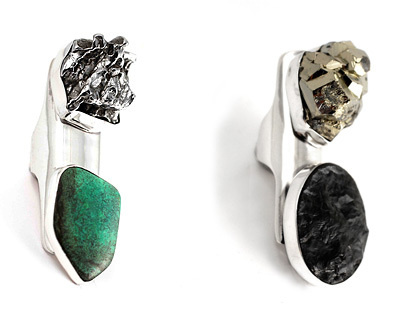 Colloidal stones of Shadow Canyon Jasper and Malachite Azurite are hand bezel set in sterling, drilled and cantilevered. Stones are all natural in color and form. Jasper measures 50mm wide x 60mm tall and Malachite Azurite measures 50mm wide x 37mm tall. Hangs like a mobile on a 19 inch chain. Necklace is hand bezel set and framed sterling. One of a kind and rare cut stones of Obsidian and Willow Creek Jasper. Obsidian measures 4 inches tall and 2 inches wide. Willow Creek Jasper measures 2 inches in diameter and a bubbly 18mm high. Hangs from a 20 inch chain. The kind that is unbreakable. 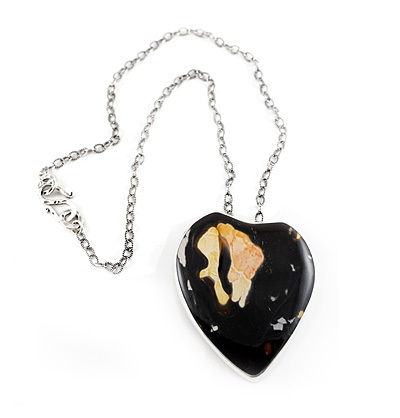 Heart necklace is hand bezel set sterling and Fossilized Wood. Necklace measures 58mm wide x 70mm tall and hangs from a 19 inch long chain. 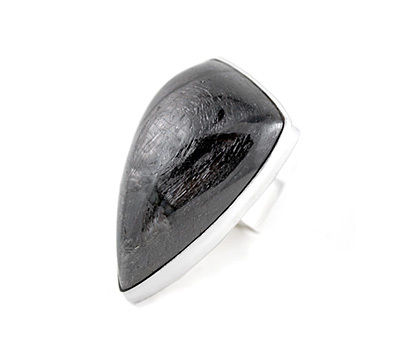 A pretty and moody looking hypersthene stone adorns this ring. Specialty cut, high domed with many angles and a high polished raw finish. I just adore seeing all the natural inclusions sketched into the stone and how the colors change and move with the light. Hypersthene stone measures 30mm wide x 46mm tall. One of a kind, and hand stamped and numbered as one to collect. 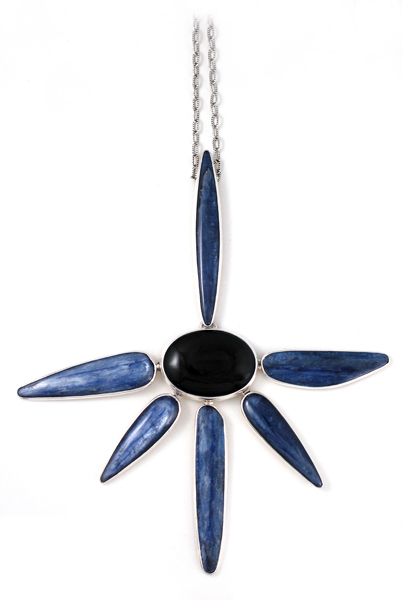 A celestial statement necklace made of deep blue silver shining Kyonite and Obsidian gems. Necklace measures 6 1/4 inches wide by 7 inches tall and is hand bezel set in sterling. Glowing Obsidian center gem measures 30mm tall x 40mm wide. Hangs from a sturdy 18 inch chain. A one of a kind and made for all you shinning stars out there. A ring made to remember the pop culture of the 70’s. Hand bezel set sterling Jasper is all natural in it’s vivid aura of tans, beiges and rust colored browns. Ring measures 35mm tall x 20mm wide. 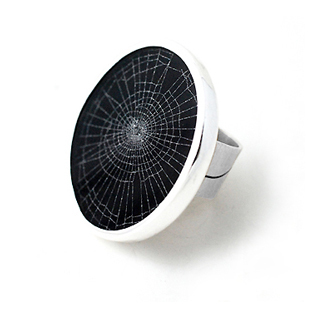 A real spiderweb is delicately preserved in glass for this hand bezel set piece. A one of a kind treasure from mother nature to hold on to. Spiderweb measures 1.5 inches in diameter and are always one of a kind. 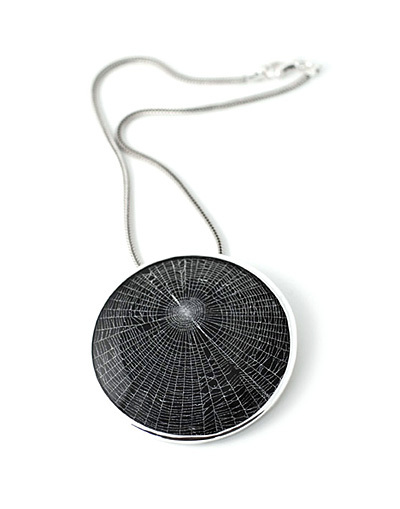 A real spiderweb is delicately preserved in glass in this hand bezel set piece. A one of a kind treasure from mother nature to hold onto. Spiderweb measures 3 inches in diameter and are always one of a kind. Made from stones that look as though they have been sculpted out of the sky. 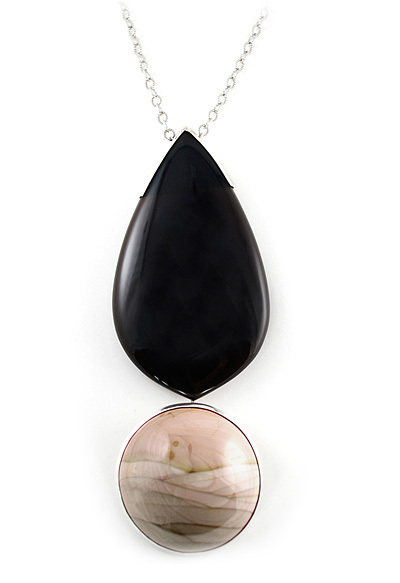 Collector stones of white and grey banded agate and a rare metallic ore are hand bezel set in sterling. Banded Agate measures 74mm wide and Metallic Ore measures 35mm wide x 53mm tall. Chain length measures 18 inches. 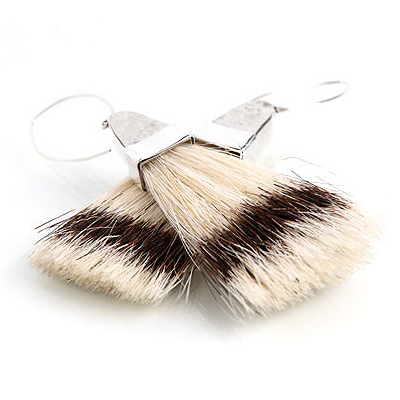 Vintage horsehair tassel earrings. Hand hammered sterling cap. Each hand built and framed with a pretty high polish finish. Earrings measure 4 inches long and are light as a feather when worn. This ring is decorated with an alluring combination of stones. 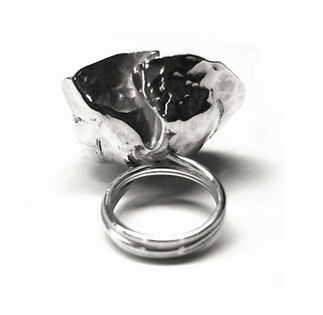 Ring is entirely hand formed, forged and built from raw sterling sheet. Curved to cradle your finger and tapered at the back for a comfortable fit. Fits like a standard ring. Ring height measures 2 inches tall in length. Built with temper, whim, and air …and hoping it will take you to a special place. 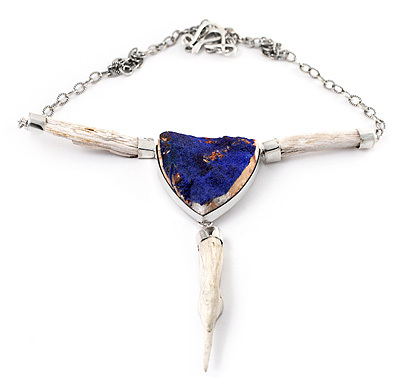 An all natural and raw electric blue azurite gemstone is framed by white petrified willow wood tree sprigs. Hand bezel set and capped in sterling. Crystallized azurite measures 40mm wide x 42mm tall. Necklace length measures 22 inches long. Hangs on a 18 inch oxidized pattern link chain. Hand stamped and numbered as a one of a kind to collect, with the beauty of the American Landscape in mind. 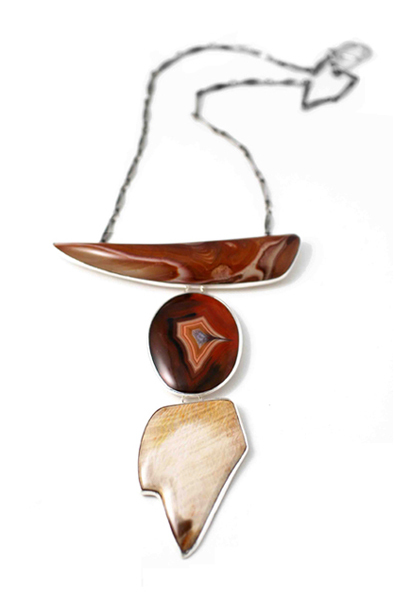 Rustic and colorful this necklace was designed with nothing but dreaming of remote regions in mind. 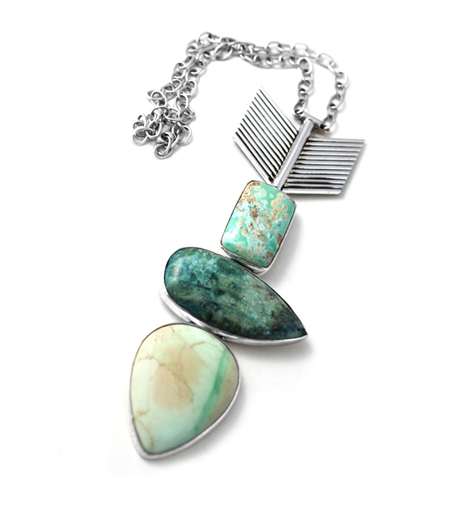 Variscite and Petrified Wood are each hand bezel set in sterling. https://dollybirddesign.com/exclusive-gems/ https://dollybirddesign.com/exclusive-gems/ https://dollybirddesign.com/exclusive-gems/Variscite measures 80mm wide x 25mm tall and Petrified Wood measures 55mm in diameter. Poppies have long been used as a symbol of sleep, peace, and death. A mysterious flower with vivid colors that act as a torch. 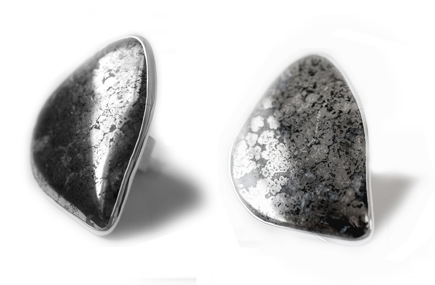 Ring is hand formed, hammered and shaped from pure sterling sheet. 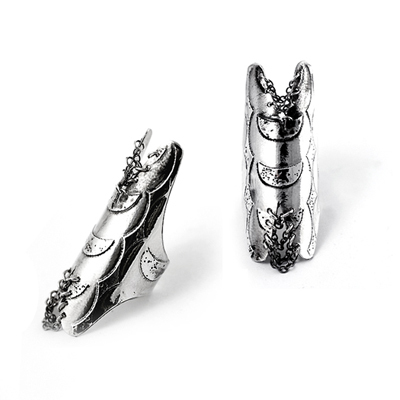 Measures 1.5 mm in diameter, and will be an eternal garden to sit upon your finger.